It’s a beautiful day outside, and with all the inspiration on the Nike Running Facebook page for the Run This Town mission they are having, I decided to create my own unique run! With the streets of London not being as symmetrical as those in the states, I really did need to plan! 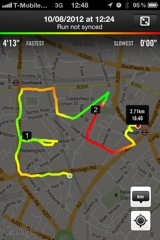 I did this using Places on the Nike+ website; printed out the route and off we went today lunchtime on the ‘Elle’ run! The route started close to the office, taking us towards the River Thames, then through the back streets of Southwark finishing up in Borough on the High Street leaving us with a 10 minute stroll back to the office in the sunshine. A little unsure of the Nike+ Running app (which can currently be downloaded free of charge) I paused the run between the end of each letter and the start of the next. However, looking at the route map afterwards this seems to have made no difference. 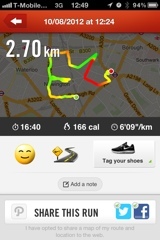 The run I logged was 2.70km, but in total it was 3.21km lasting 21.5 minutes. The run also earned me approximately 1000 NikeFuel! It was a pleasure not to be in the gym, but having been running on a treadmill, the difference running on the roads and pavements was apparent! So, will you get in the game and Run This Town?! The ‘Elle’ run was for #London!! Check out the UK Run This Town (or USA) event page on Facebook.